Oil prices are falling, but American crude is suffering even worse than its international counterpart. The price differential between WTI and Brent continues to widen, briefly hitting $9 per barrel on Monday, the largest discount in about three years. Discounts of this magnitude are pretty rare, particularly after the U.S. began exporting crude oil several years ago. There is a self-limiting aspect to these price differentials. If WTI falls significantly lower than Brent, then American crude oil becomes highly attractive to foreign buyers. Refiners around the world move to purchase as many cargoes as possible, removing the surplus from the U.S. while at the same time loosening demand on Brent cargoes. The result is that there is pressure on the two benchmarks to converge once again. We saw this play out last year after the devastation from Hurricane Harvey, which decimated refining capacity in the U.S. and led to a buildup in crude oil supplies. The discount, which jumped from just a few dollars per barrel, widened to as high as $8 per barrel, although only briefly. U.S. exports surged because of the marked down price, and by early 2018, the discount narrowed. However, the discount has spiked once again, although the situation could be a bit different than before. This time around, the discount isn’t merely a manifestation of surging shale production at a time when OPEC is keeping the rest of the market tight, although that is certainly a major factor. But adding to those forces is a pipeline bottleneck in the Permian, which is leading to a higher volume of supply trapped in West Texas. That means that the Permian pipeline system is essentially maxed out. There is now a rush of demand for trucking oil from West Texas to the Gulf Coast, a bizarre side effect of the bottlenecks that have cropped up. Moving oil by truck is costly, so Permian drillers that have not already secured pipeline capacity are being forced to discount their product in order to secure sales. It isn’t just Permian bottlenecks. Falling production in Venezuela and the prospect of outages in Iran have tightened the market elsewhere, keeping Brent higher than WTI. “It’s a function of U.S. oversupply and OPEC policy,” J. Alexander Blackman, an executive at Standard Delta, told the WSJ last week. 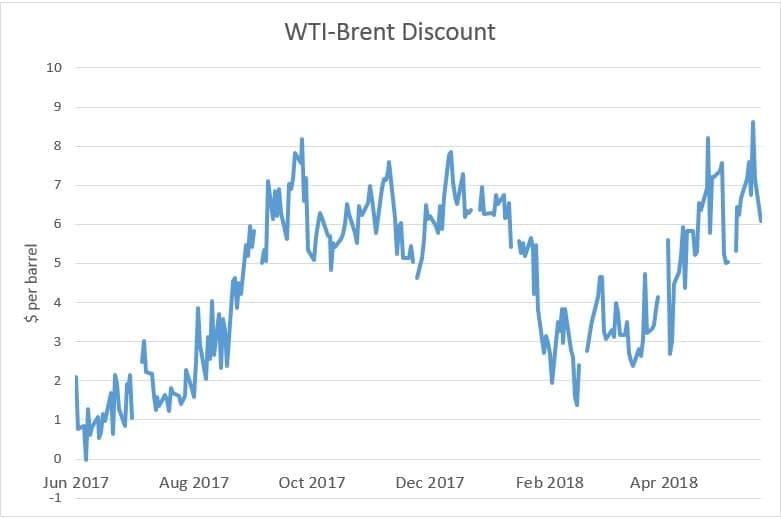 Of course, a $9-per-barrel discount relative to Brent suggests that everyone is going to want to buy U.S. crude oil on the cheap, which means that exports could spike in the coming weeks. U.S. oil exports already hit a new record at 2.566 mb/d for the week ending on May 11, before dipping a bit in the most recent week. But, the trend is clearly up – last year, exports bounced around between 0.5 and 1.5 mb/d, hovering close to the upper end of that range in the second half of the year. For most of 2018, U.S. weekly oil exports have been hovering around the 2 mb/d range. Exports could average around 2.3 mb/d in June, one prominent oil executive told Reuters. The wider the discount between WTI and Brent, the more U.S. oil will find its way to Asia, despite the long distances. And at $9 per barrel – the largest in three years – there will be tremendous pressure working to push more barrels out from U.S. ports to buyers around the world. That is, as long as U.S. shale drillers are able to find a way to get their oil from West Texas to the coast. That means that the US$ will be going weaker and weaker further and further against esp Asian currencies such as Won, Yen, Yuan, TWD etc until the 1st half of 2020yr. In fact, it is a big mutual benefit between the Asian countries and USA means that usually the US oil's api and sulfur, is so called light and medium sweet crude quality, are pretty lower than those oils from the Middle East, which are mainly heavy sour crude oils, will save the Asian refiners's refining cost in using more US oils. Long story short, the US$ index, is around 94, will be down to the level of 89-91 before end of June, means that the WTI will recover its price into 70-80$ bb/ls. However, as I've said since June of 2017 last year that the oil price range 70-80$ will be the average price level to the end of Trump Era based on my Math. Buy the Asian currencies above against US$, those currencies will get you hefty returns by the 1st half of 2020yr. But do not consider put your into Aussie$, NZ$, Canadian$, Singapore$, H.K$ etc against US$. Esp Singapore and H.K, the two city states are losing fast their positions as financial and oil hubs in the Asia. Either that or Brent is wildly overpriced in a market manipulated by a Wall Street/Saudi coalition and the only transparent market in the world is massively oversupllied. Based on supply & demand, oil should be @ $40 right now.